A few different things have conspired to bring me back around to finish up the documentation for the Willamette, as well as forcing me to re-examine a few elements of the rig design. One of those things was an e-mail from AA0ZZ (really cool to hear from the designer of the PIC-EL and the IQPro) asking me about the very broad response of the audio filter. This is one of those design choices that made sense at the time, but doesn’t seem so wise now. My theory was that it might be nice to leave as much of the “direct conversion” sound intact, while trying to knock down the most annoying higher frequency sounds. It also would have allowed someone to move the receiver to the SSB band without changing the filter (but honestly how often would that happen?). However, I’ve had a few people question the choice of such a wide open filter, and rightly so. Fortunately, it’s easy to change some components to alter the filter to create a much better response for CW. The design for the filter was taken from the active AF filter discussion on page 80 of Solid State Design for the Radio Amateur. 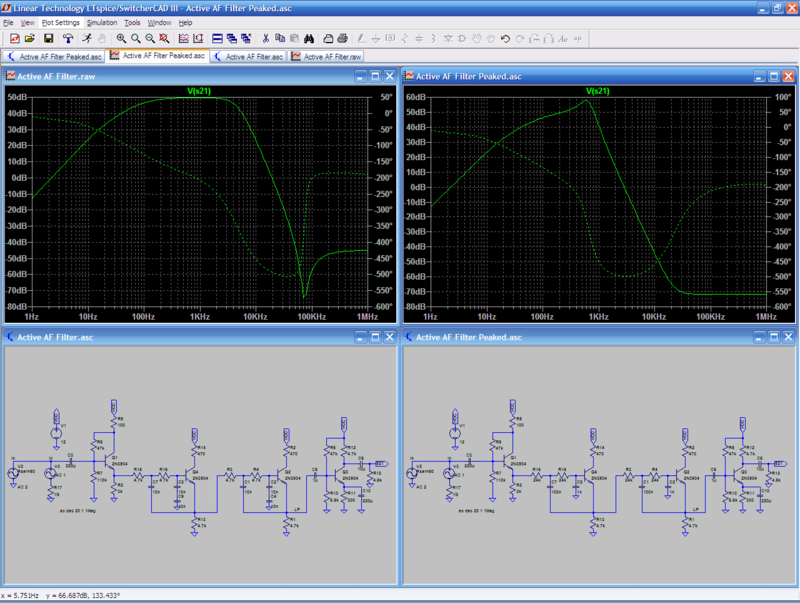 The filter topology is not so much low-pass, but peaked low-pass. The peak is based on the Q of the network, which in this case is determined by the ratio of the two capacitances in the filter section. As it is currently designed, the response is nearly flat across the passband, which corresponds to a network Q of 0.5√2 (the ever-popular number 0.707). By changing feedback cap to 100 nF and the shunt cap to 1 nF the network Q is increased to 5, which does pretty much what you would expect it to do. The value of the series resistors had to be changed in order to keep the peak at 600 Hz. Those are the only changes needed to drastically change the filter reponse. In the attached screenshot, you can see a LTSpice comparison of the two responses. The new filter constants give a much steeper high frequency roll-off and also gives better attenuation of the nasty low frequencies of 120 Hz and below. I haven’t actually made the changes to the filter as of this morning, but I expect to do it very soon. Assuming that it works as designed, I plan to roll out the change to the design in version 2.0 of the rig. I’ll also put the changes in the current 1.x build documentation section about rig modifications.